The first thing I decided to tackle about the looks, was the nasty paint. The 1st gen tauruses have a tendancy to shed their paint, so to speak. I also disliked the 2-tone look with the bumpers a different color. 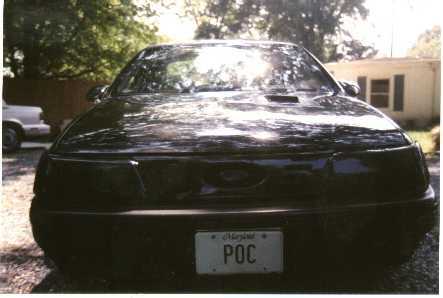 I elected to get a gloss-black paintjob from the local Maaco here in Maryland. I lucked out, and got it done during a special sale, where they sanded, primered, and painted my car for me, all for $250! Not bad. I got rid of the nasty Taurus hubcaps. I got a set of black 5 star hubcaps from Trak Auto for about $20 as a temporary fix until the rims. The day I got my pirelli tires, I took the car on curvy roads to test the suspension, and lost 2 hubcaps, so I took the others off. I disliked the chrome bar going around the bumpers and side paneling of the car. 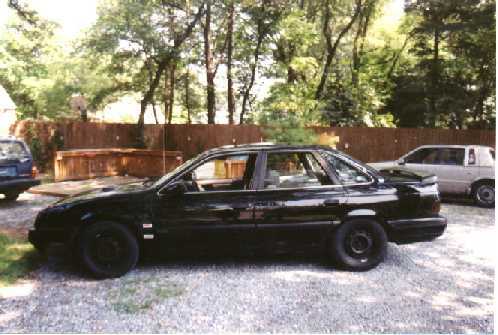 I used gloss black paint to paint the chrome stripe around the car to match the black of the car. This shows the previously chrome bar as black. It is like this all the way around the car. I wanted something different for the front grille. I wanted it to stand out. First, I went with a homemade "grill" idea. It looked better in theory! I threw that away, and put back on the stock grille, thinking of what to do. Then I found that SP Motorsports sells 1st gen Police Package grilles for $100. $100!! 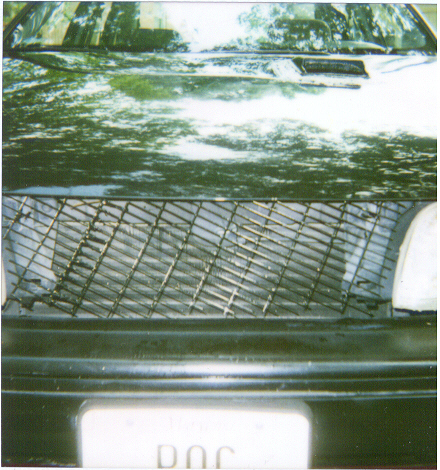 Thats too damn expensive for a grille, so I removed the stock front grille and used a dremmel tool to cut 4 slots in each side of the FORD oval to look like a police package grille. It looks nice, and saved me $100. This shows the front grille. Its kinda hard to see, but its there. I heard from someone on Todd's Taurus Performance Message Board that he put an SVT badge on the car, to help the myth of the Taurus SVT. I decided that since this car is looking better, will look even nicer, and will perform like a true sports sedan, I will add an SVT badge too. So, I called my local FORD dealership and ordered an SVT badge from a Mustang Cobra SVT and put it on the back of the car. This shows the SVT badge on the rear. Now, since the car is ALL black, I decided to get rid of the red taillights. I decided against the clear taillight mod listed on the mod section here, and instead went with an all black approach. I got NiteShades spray-on tint, and masked off the back of the car, as well as the reverse lights, and sprayed a few coats on them. The lights look like black body panels, until they light up, where you can still see the red lights. I recommend only using 3 coats or less. Thats what I used. This shows the tinted taillights. Now with the taillights black, I tackled the last major non-black part of the car. I got a set of GTS Headlight Covers. This dramatically enhanced the looks of the car. Especially on the 1st gens with the huge headlights. Here are the headlight covers on the car. Then I decided to make the car look more sporty. To do this, I felt it needed a spoiler. I disliked the SHO spoilers, because they were little lumps on the trunk. I also disliked the "Super" spoilers like on the imports, because it wouldn't look right on a Taurus. I wanted something sporty, yet not super-sporty. I got the mid-ranged spoiler. To mount it, I drilled 4 holes in the trunk and followed the instructions that came with the spoiler. This shows the spoiler. I drilled holes and mounted it myself. 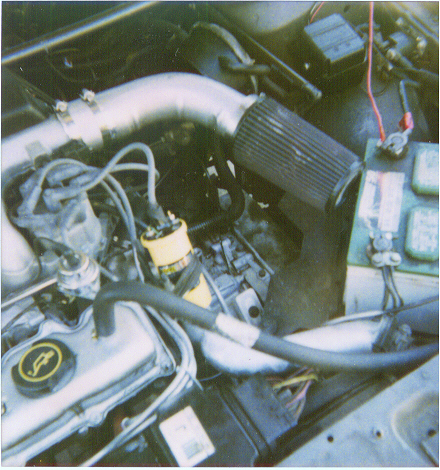 Then I decided to get a few more horsepower by keeping the engine cooler. 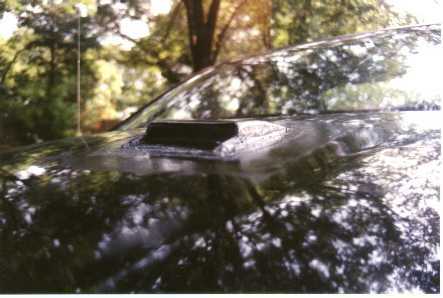 I decided on a hood scoop. I ordered this for $12 from JC Whitney, and popped it on myself. I liked the look of it, so I am putting it in this section as well! This shows the scoop. As of this pic, it remained unsanded and unpainted. I was bored one day, so I decided to do something cool, yet simple. I removed the panel on the ceiling, and painted the dome light neon red. With yet another one of my stupid ideas, I decided it would be fun to have a TV in the dash where the glovebox was. So, I cut the glove box in 1/2 and put the TV in the other end. It ended up not working, and I trashed the other half of the glovebox, so I mounted some paneling to turn the gap into a foot rest. I wanted the inside of the car to be as "modded" as the outside, so I removed the dashboard, and painted it all black. It looks much nicer now. This shows the black dashboard. 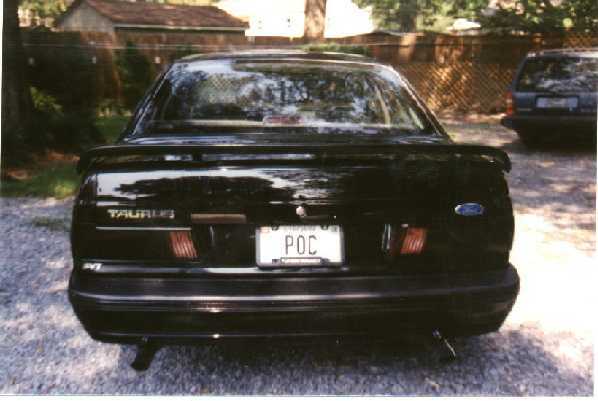 I wanted the white gauges that many performance imports and domestics have available, but nobody had any for a 3.0 taurus! So I got creative. I removed the normal gauges and did a reverse-negative scan into the computer. I printed the file out and mounted it. The instructions are on the main TCCA page. Its a definate bonus! 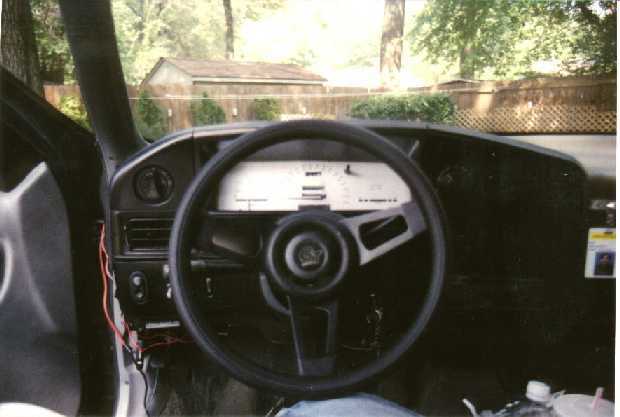 This shows the white gauges in the dash. Nice looking! Now, about this time, the stock steering wheel was annoying me. It just didn't look right. So I started out by cutting it like the steering wheel from Knight Rider. But, a friendly cop informed me it was illegal. So, I bought a Grant "GT" steering wheel and put that in. It looks much better and sportier than stock. Then with all the mods, I decided some security was in order. So for security, I installed a WASP security system. You can see the alarm in the top right corner. With the performance sedan the SVT Taurus will become, I decided a Tachometer would be a good investment for watching over the engine. I got one from my local Trak Auto for $30.00. It took maybe 45 minutes to install. The green wire went to the - side of my ignition coil, the black was ground, red was power and white was fader for the back-light. The tach looks and works great! Pics coming.